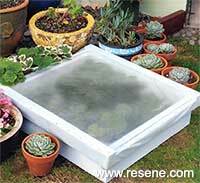 Mark Rayner creates an inexpensive cold frame from treated battens, fence palings and some recycled clear plastic. You will need: 19mm flat head galvanised nails, 50mm jolt head galvanised nails, two 1.2m fence palings, 25mm x 50mm treated battens, clear plastic, craft knife, hammer, paintbrushes, pencil, PVA glue, sandpaper, saw, set square and tape measure. 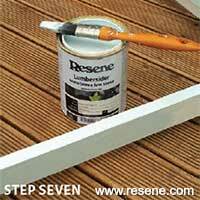 Resene Quick Dry and Resene Lumbersider – tinted to Resene Escape. Measure, mark and cut the two fence palings in half. Smooth rough edges with sandpaper. Assemble, as shown, to form the base box frame. 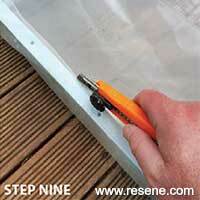 Fix at each corner with PVA glue and nails, ensuring corners are at right angles using the set square. Allow glue to dry. 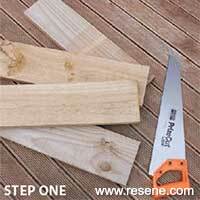 Measure, mark and cut four battens to create a top frame slightly larger than the base frame. 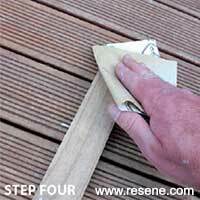 Smooth rough edges with sandpaper. 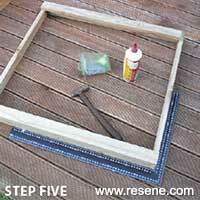 Assemble the top frame, fixing at each corner with PVA glue and nails. Cut two more pieces of batten and attach along opposite sides of the top frame for additional strength. 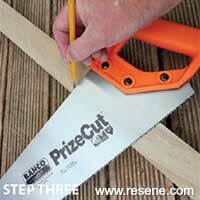 Ensure corners are at right angles using the set square. Allow glue to dry. 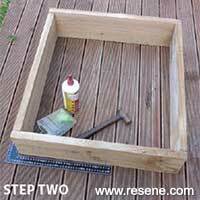 Apply one coat of Resene Quick Dry to the top frame, allowing two hours to dry. 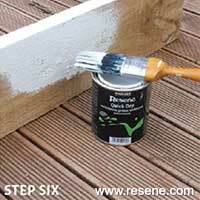 Also apply one coat of Resene Quick Dry to the base frame, allowing two hours to dry. 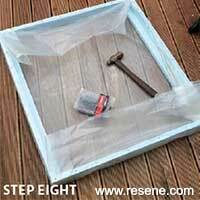 Apply two coats of Resene Escape to the top and base frames, allowing two hours for each coat to dry. Fix the plastic sheeting to the top frame with 19mm flat head nails, folding around the frame and under the edge, as shown.